This was The Big Day for rapids. We went through four major ones: Horn Creek (rated 8 out of 9), Granite (8), Hermit (8), and Crystal (9). After that came five smaller ones in succession: Tuna, Lower Tuna, Agate, Sapphire, and Turquoise. 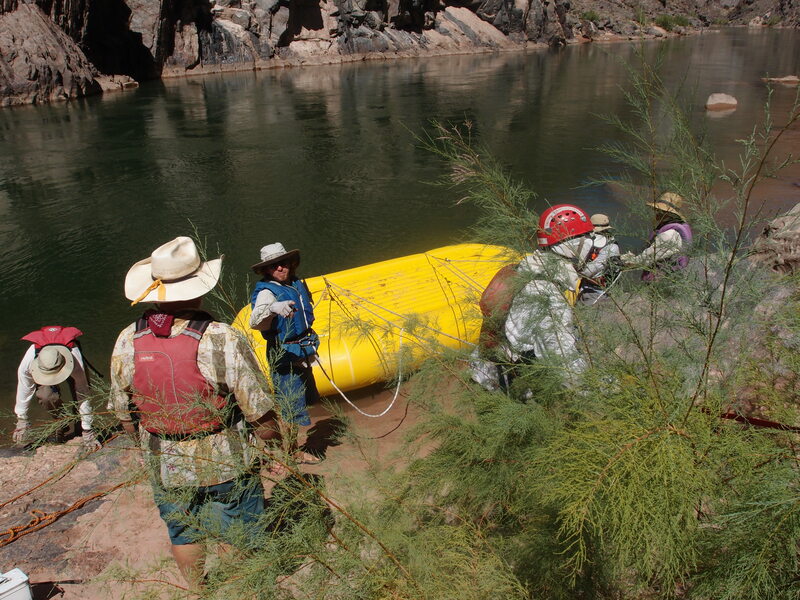 As we packed up, everyone was thinking about the swimmers we plucked out of the river on Day 7. 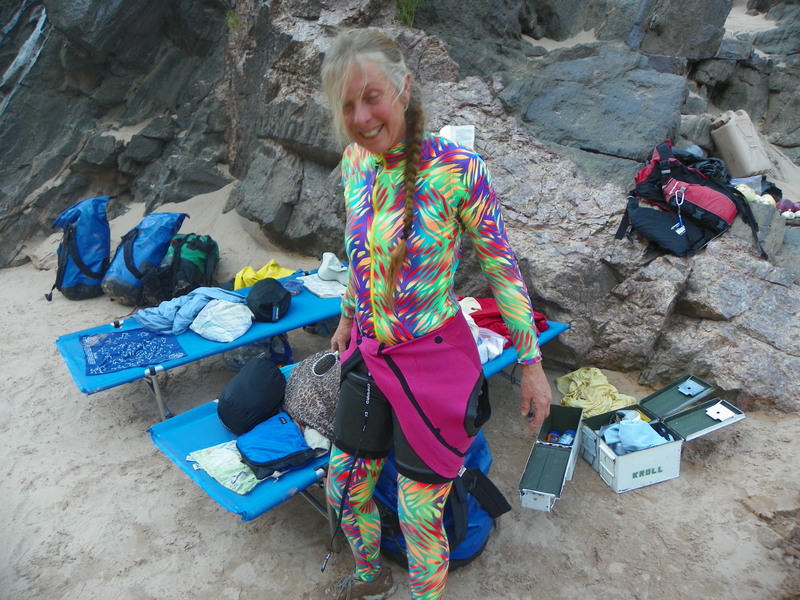 Nan put on the green wetsuit she called her “Gumby suit,” and Christie wriggled into a jungle-pattern dive skin under a lightweight short wetsuit. Anybody who had a helmet put one on, too. We set off around 8:45 am. The first big rapid, Horn Creek, was one mile downstream, and we could hear it for most of that mile. From a distance, it looked like the lip of a waterfall viewed from above — except that every few seconds, a jagged white line of foam would erupt and fall back. It was not a welcoming prospect. Each big rapid is like a problem set. Horn starts with two exposed rocks in the middle of the river at the top of the rapid. At higher water, Rod explained, rafters can run through the middle. But today the flow was lower, about 8,000 cubic feet per second, so the only possible run was entering on the right and then pulling to the left. “Peter wanted to run second behind Rod so that he could be close enough to see Rod down in the meat of it while we were still on the lip. Rod pulled away from shore, set up and dropped into the long green line, tucked under the right horn. He pulled hard and . . . popped an oar out of the lock. Afterwards we joked that Peter, having said he wanted to do what Rod did, was busy trying to free up an oar. “In practice, watching Rod cost us a few stationary seconds we didn’t have. The raft lost momentum and just a few feet off the mark, crossed the over the green line that would have carried us left. Once in the maelstrom on the right, neither oars nor a paddle could find purchase in the foam. Things slow down before you hit. It feels as if there is still infinite time to get the paddle down, to dig in, to come up with a big stroke that pulls the nose of the raft out far enough to catch friendly current. “The reason Horn Creek requires a hard left pull back to center is that the water going right around the right horn tumbles with determination into a piece of schist about 10 foot square that juts out from river right. It looks like polished walnut except with dozens of small, perfectly etched pockets. When viewed up close it resembles a black walnut’s shell. We hit the rock, not hard, just a bump, but unrelenting current pounded the upside tube, gluing us to the rock. I now know how a fly feels on fly paper. 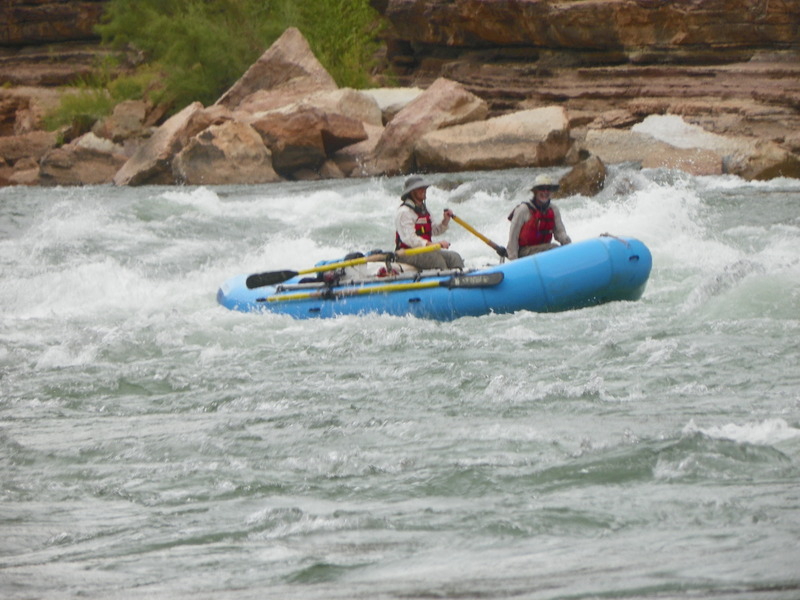 “Tim’s blue boat with Chuck up front was already in the rapid and not far behind. The importance of finding and following the clear green streak was not lost on Tim. He had the mildly annoying habit of being able to read the water well enough to set up, and just sit there while the rapids did the work. As they passed us just a few feet farther out, Tim was leaning back against the oars hauling for his life. They wheeled past comfortably, disappearing behind the rock. “It still seemed like with a good push we might work the raft just enough to shift the balance forward and that might spin us out. Which is when the current took hold of the upstream tube, sucked it under and started pushing the raft up the rock sideways. If the raft flipped we were going to be under it or pinned between the raft and the rock. It seemed like a great time to take a hike. The rescue was another example of Tim’s elegant style. 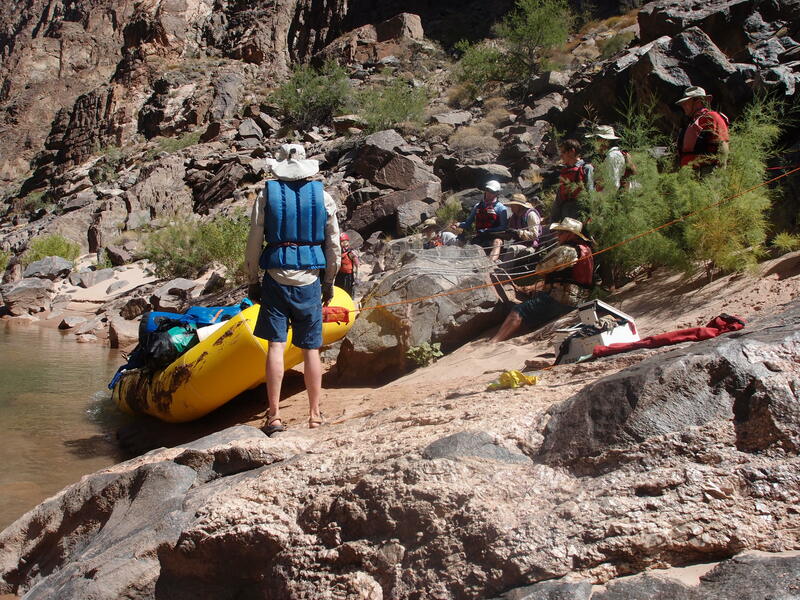 Seeing that Pete and Christie were in trouble, he quickly maneuvered his raft into the eddy below the rock and plucked them off it. They never even got their shoes wet. Almost all of their gear stayed with the raft, too. Someone fished a daypack from the river, its straps ripped from their seams, and a white five-gallon bucket, its handle twisted, got away. We never saw it again. That was the only thing the river ate. 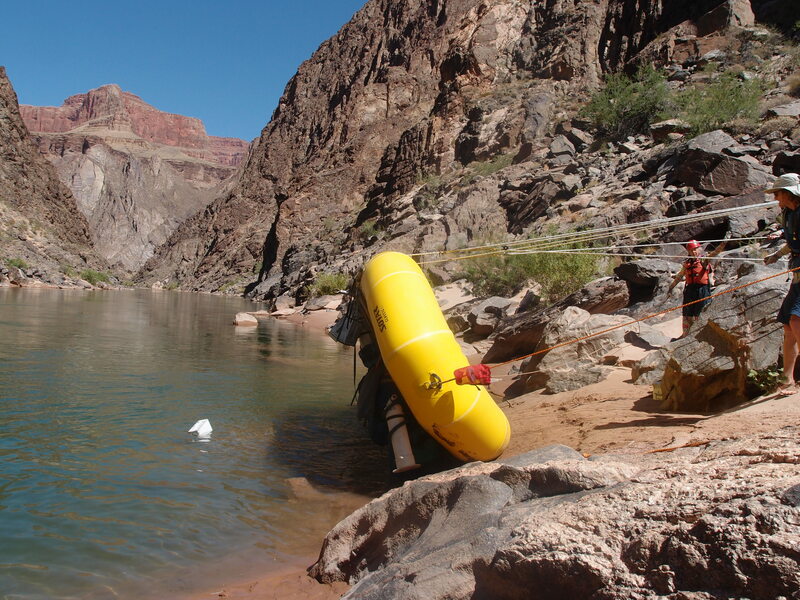 An 18-foot raft is about 7 feet wide and, loaded, weighs upwards of 1,000 pounds. Rod, who had seen this kind of thing happen before, had packed a rope and pulley system. Peter, who always seemed to be thinking about disasters, had packed ropes too – but they were in his raft and were now underwater. So we used Rod’s rig. This crew had an embarrassment of gear and talent. Pete and Jim Kirchner both have advanced engineering degrees, Pete and Christie are skilled with rope rescues, and Rod knows rafts. Still, it took an hour for them to flip the thing back over (with Mel taking pictures). They strung up a 3:1 haul system, also known as a Z-rig, which used the pulleys in such a way that hauling three feet of line lifted the boat one foot. The rest of us sat around on a tiny sand spit until the raft was right-side up again, so we could survey the damage. Thankfully, there wasn’t much. An ammo box holding Pete and Christie’s camera had a bent hinge, but the hot air in the ammo box had contracted in the cold water, creating a vacuum that kept the seal tight. That miracle of physics saved many of the pictures you are enjoying in this blog. But it took us an hour and a half to recover from the flip, so there weren’t any hikes today. Granite rapid was three miles downstream, with an equally fearsome reputation. A ridge of lateral waves comes off the wall of schist on river right, leading to a hole at the bottom. The move at the bottom requires a boatman be mindful of what he is doing. We scouted Granite by walking through a brutally hot beach held in place by dead trees. The sand was eroding back from higher levels probably deposited during one of the high flow experiments, where up to 90,000 CFS are released from Glen Canyon Dam for a few days in order to stir things up and replenish the beaches. The experiment also aims to get rid of invasive tamarisk so native plants can come back in. The beach had native trees planted in rings or cages, and jugs were nearby for watering them. Perhaps a third of them were dead anyway. Even with help, this is a tough place to live. 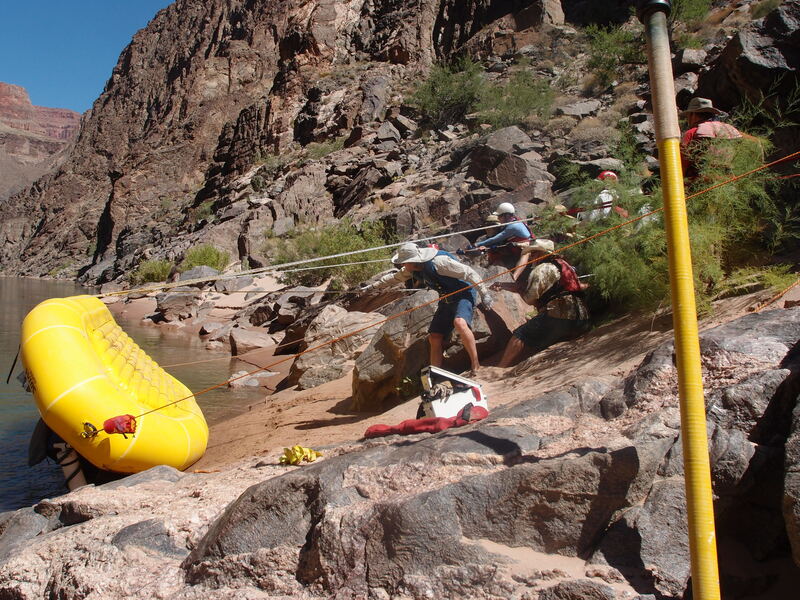 Peter was quiet but determined during the Granite scout, and he got through the rapid without any problems. We all did. Hermit and Crystal rapids were similarly exciting but uneventful. I had heard that the waves in Hermit could be 30 feet high, but the low water had truncated them. They were perhaps ten feet, which is plenty high, but as long as you didn’t hit them sideways (and no one did), they were not dangerous. 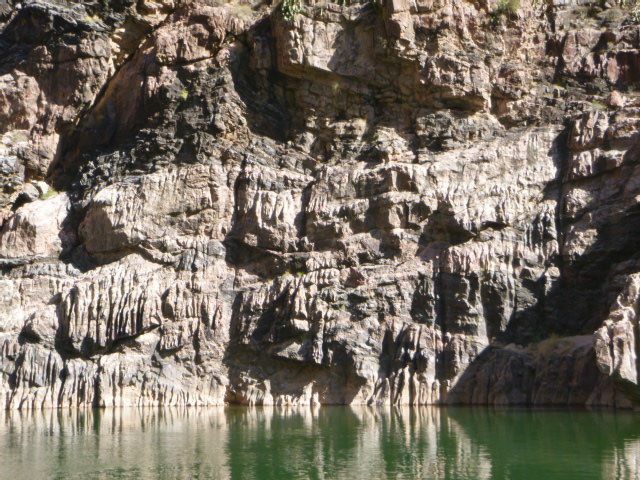 And Crystal is famous for a garden of rocks at the bottom that jut out into the water and snag unfortunate rafts, but we all avoided them. Pedro made it look easy, although it wasn’t. We held a small celebration on a beach below the last big drop and chanted “ABC – Alive Below Crystal”. Who knows whether the boatmen were paying closer attention, or if the waves had aligned correctly? And really, who cares? We were all uninjured, and the only gear that was lost that day was that white plastic bucket and three bagels too soggy to save. Pedro gave me the oars as we headed through the smaller rapids. 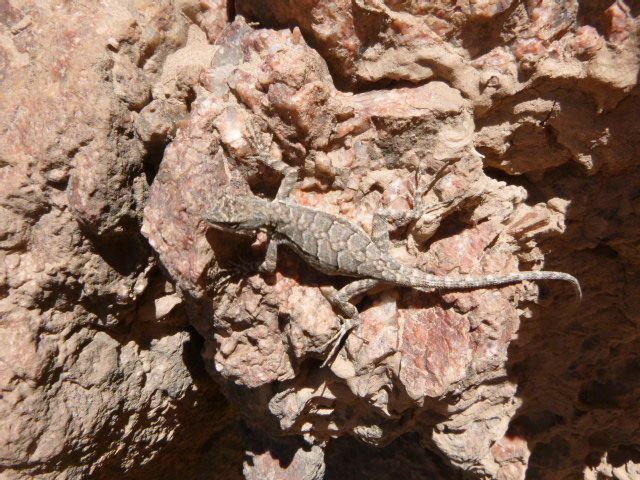 The view was still stunning, a tableau of polished black schist and pink granite cliffs, and we enjoyed five more miles of bumpy fun before we got to camp. New Shady Grove is a small campsite tucked into the top of a sheltered dune on river right. It has a little bathing beach that is separated from camp by an outcrop, and the far side of the outcrop has a schist seat with niches for soap and toothbrushes. Peter and Christie unpacked the raft and dried out their gear in the broiling afternoon sun. Everyone washed their hair. Dinner was, once again, delicious. We had an appetizer of Greek olives, dolmas, sardines, kippers, and crackers, followed by chicken with basil and thai chili, coconut rice, and fruit salad of apples and mandarin oranges. I don’t remember who made dinner. It had been a great day, but we all needed a drink.